This Sunday, I received the sad news that Gregor Scholz of Bestwinus had passed away. This struck a particular chord as Gregor’s visit to the UK was one that I remember well. Gregor was a shining example of how determination and self-belief can help you achieve your goals in life. 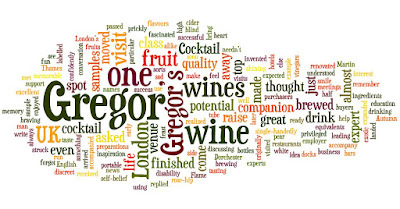 The idea was to visit some of the premium wine purchasers amongst the top class hotels and restaurants in London to raise interest in Bestwinus’s first class fruit wines, brewed and quality controlled by Gregor himself. Before he arrived in the UK, we had great fun trying to find English equivalents for his imaginative fruit wine names – from Autumn Flame (a rose-hip wine) to Druid’s Magic (a cider). I do not drink but I was fascinated nonetheless. Gregor’s passion for brewing had come at an early age, through his father, I believe. He would only use the finest ingredients and had expanded to create wines from fruits as exotic as prickly pear and drinking vinegars from beetroot (something we later learnt as of great potential to the Far Eastern market). When he landed in Gatwick, I had made all sorts of preparations because I heard that he was almost blind. I needn’t have worried. He came with a friend to accompany him but Gregor coped just fine. I soon forgot about his “disability” as we confidently moved through the bustling metropolis that is London. What else should I have expected from a man who single-handedly brewed, bottled and labelled his own elite vintages! At meetings, he would bring out his sample bottles and arrange them in order ready for the presentation and from there on he was off the starting line - professionally offering samples and discussing the finer flavours with top wine buyers, chefs and Cocktail experts alike. Martin Straus, a UK wine expert accompanied us on all our visits and we all made an excellent team as we moved from venue to venue. It was only when we had walked to the Dorchester through half of London, because it was easier than braving the traffic, that Gregor’s companion pulled me to one side and said “you do realise he has a heart problem!” that we understood that he was even more remarkable than we had originally thought. That extra bag with the discreet white tube leading under his jacket was his portable life support. As I said I do not drink, so the most memorable moment for me was when we visited one of London’s renowned cocktail bars. The conversation and tasting by the resident Cocktail expert had almost finished when he asked for another one or two samples and then invented a cocktail using Gregor’s wines as a flavour on the spot. A visual feast, even I had to taste them. I am saddened by his passing away but also feel privileged to have met him. I raise my glass in your memory Gregor, you have been an inspiration!